From 1711 until 1917, the Winter Palace was the home to Russian Tsars, Tsarinas and their families. The need for fortified residences was lessening in the 18th century, and the palaces reflected this shift. Three distinct Winter Palaces were built, torn down and rebuilt until 1754 when the fourth and final palace was created for Empress Elizabeth Petrovna, who was the daughter of Peter the Great. Baroque in style, it sits grandly, on the bank of the Neva River in St. Petersburg. It is a majestic three-story building with a whopping 1786 doors, 1945 windows, 1057 halls and rooms, and 117 staircases. The enormity of the palace clearly symbolized the power of Imperial Russia. This last Winter Palace was built between 1754 and 1762. Francesco Bartolomeo Rastrelli, a great architect of the time, was the chief designer of its grand Baroque style. He designed many different compositional facades over the whole palace, which created very unique impressions and points of view depending on where a person stood. Windows and doors had whimsical shapes; Corinthian columns graced halls; statues and vases stood proudly on the roof; and lavish, rich colors adorned the walls. The palace occupied a whole block and symbolized all things Russian Baroque. Sadly, Elizabeth Petrovna died before its completion, so she never got to live there. Catherine the Great and her successors did. In 1837, a huge fire destroyed much of the house. It was rebuilt and renovated a few times after that, always in the Baroque style but altered a little to include Neoclassical style as well. It was home to the Russian monarchs and their families until February 1917 when the Romanovs were overthrown in a coup d'etat. Later that same year, the palace, which had become the office for Alexander Kerensky, Minister of Justice and later Prime Minister of the Russian Provisional Government, was attacked by the Red Army. The Winter Palace housed the finest vintages and was said to have the largest stock of wine in the world. Following the attack, the looting of the wine cellars fueled the mob for a full month. In an effort to calm the situation, the Bolsheviks attempted to pipe the wine from the cellar into the Neva River, but crowds came to the drains and drank the wine right out of the pipes. 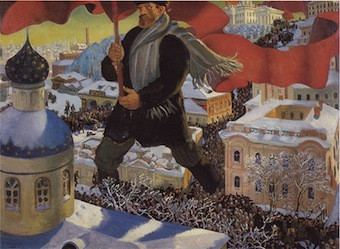 Finally, in December, the Bolsheviks had to impose martial law, but order was not restored until the beginning of the new year. This time has been called the greatest hangover in history. Just as the palace itself was built as a symbol of the power of Imperial Russia, the storming of the palace in 1917 became a symbol for the Russian Revolution. Many artists have depicted that scene in their work. Today, the Winter Palace, with four other buildings next to it, houses the huge art collection of the Hermitage Museum. It is the largest art gallery in Russia, and one of the most respected in the world. This "beyond the book article" relates to The Romanov Sisters. It originally ran in June 2014 and has been updated for the June 2015 paperback edition.